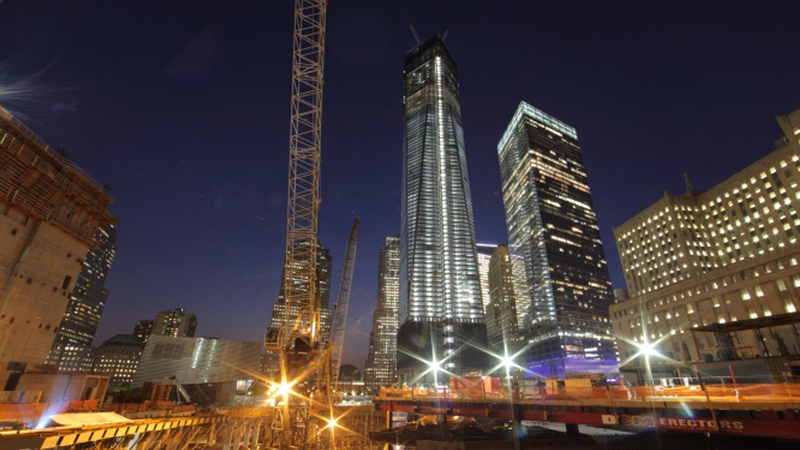 REBUILDING is the epic story of hope that is emerging from rubble and chaos of 9/11. Since 2006 artist and film maker Marcus Robinson has spent over 2000 days filming the vast new towers rising out of the bedrock of New York City. Using a combination of observational documentary and breath taking time lapse photography this dramatic and stylish film is an artist's tribute to the tenacity of New York’s construction workers and the spirit of renewal and endeavour that permeates this unique project construction site. Marcus Robinson is an artist and filmmaker specializing in urban transformation and architecture. He graduated from Cambridge University in 1982 with a degree in Modern Languages. Since then his work has been shown in solo exhibitions around the world including at the Carrousel du Louve in Paris and the London Film Festival. Marcus was born in Belfast, Northern Ireland. His father was a builder and as a child he spent many afternoons in the construction depot fascinated with the process of building and design. This inspiration has contributed to his career covering modern architecture and major construction and demolition projects around the world spanning more than thirty years. His art is created using a wide range of media including photography, film, music and painting. Numerous books of his work have been published including Eye (Black Dog Publishing 2007), Home (Home Office Consortium 2006) and Les Miroirs du Temps (Hazan 1992) and he has contributed many special time-lapse sequences and stills for various films including Millions (Danny Boyle, 2004) and Wonderland (Revolution Films 1999). His film The Millennium Wheel was screened at the London Film Festival and on Channel Four on the eve of the new Millennium. REBUILDING is Marcus Robinson’s current project. This is an art collection and theatrical documentary film bearing witness to and taking inspiration from the reconstruction of the World Trade Center in New York. Rebuilding the World Trade Center. Channel 4 and The History Channel. Epic time-lapse film made over three and a half years about the construction of the new Larnaca international airport in Cyprus. 13 time-lapse cameras filmed the site for years and the film was used for the official launch of the new airport. Book and film made in London about the demolition of the former Ministry of Transport (the so called 'three ugly sisters' that were 3 1960's tower blocks in Marsham street) and the subsequent construction of the new Home Office building on the same site. Mix of time-lapse and live action. The film and book won the Design Award of that year. A time-lapse documentary film made for demolition company, Brown and Mason, following the three and a half year demolition of a huge power station in Pemnroke. The film featured spectacular time-lapse footage and hyper slow motion of the massive explosions to bring down the boilers and turbine halls and chimneys. Time-lapse photography for key sequences in Danny Boyle's film “Millions”. Time-lapse sequences across six episodes of this history of Britain's castles. Filmed throughout UK. Channel 4. The story of the the making of the Millennium Wheel, now known as the London Eye recognised as the most visited and iconic symbol of modern London. The film revealed the architectural wonder on the eve of the new millennium and was subsequently screened at the London Film Festival and Channel 4. Film made for English Heritage to feature as a permanent installation celebrating the renovation of this iconic London landmark.